Ulster players Ricky Lutton and Ricky Andrew have signed new professional contracts with the Belfast-based club. Tighthead prop and three-time Oxford Blue Lutton, 28, has signed a two-year deal while 24-year-old full-back Andrew has agreed a one-year contract. "They are talented players who have become important members of our squad," said Director of Rugby David Humphreys. "I have no doubt that they will play significant roles in Ulster's future success." Lutton was on the winning side in the 2008 Varsity match and continued his rugby education with spells in Australia and New Zealand. He returned to Belfast to play for Belfast Harlequins in 2011 and his club form saw him capped for the Ravens, before he signed a development contract at the start of the 2012/13 season. 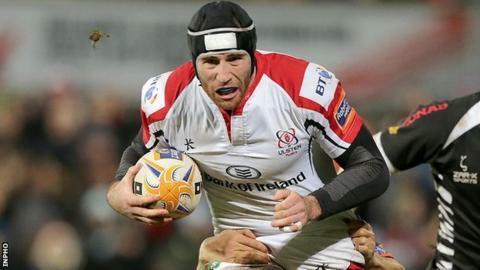 He has played 21 games for Ulster, 14 of them this season. Andrew is a graduate of the Ulster Academy and made his debut against Leinster in December 2011. He has played 16 times for Ulster so far, scoring one try.